Product placements have long been popular in music videos, but Havas client Chef Boyardee bypassed a mere can cameo to fully underwrite original work with two famous performers in a new campaign. The “Throwback Recipe Series” original song and music video is written and produced by rapper Lil’ Yachty, '70s icon Donny Osmond and Havas Annex. 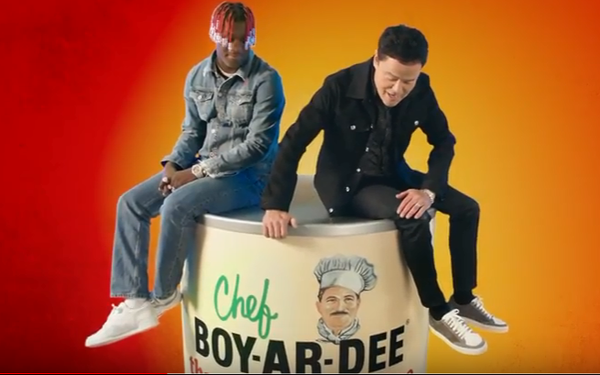 The auto-tuned song suggests that it's "Time to Par-Dee" with Chef Boyardee, while the accompanying video features Osmond and Yachty engaging in typical music video scenes, like singing in a recording booth as well as fake-driving in an old car. The song itself plays on the nostalgic “Thank Goodness for Chef Boyardee” jingle from the ‘80s, though the Throwback Recipe itself is new. The online video appears across Vevo, YouTube, ABC, Hulu, and NBC in 30-, 15- and 06-second cutdowns. Spotify and Pandora are running the online radio version and the song will be available for streaming as well. The campaign is also supported on Instagram and Facebook. The idea to work with Lil’ Yachty, a Capitol Records recording artist, and Osmond, was born out of a new partnership between Vivendi-owned properties Annex and Capitol Music Group (CMG). "Lil Yachty is a hip-hop superstar with a huge social following and Donny Osmond is a quintessential throwback star," says Havas Chief Creative Officer Jason Peterson. "These two together could fuse the best of the past and present and would appeal to our broad demographic." Last week, Havas also announced the expansion of Annex to Los Angeles with a new office, called Annex Tower Creative, located in Capitol Records Tower in Hollywood. The HA-CMG alliance will work with other brands as well, collaborating with other artists across CMG’s multiple record labels and creating partnerships within music, entertainment, art, fashion and brands to develop content and cultural experiences.